By the strictest definition, Oriental rugs are carpets hand knotted only in Asia. Iran, China, India, Russia, Turkey, Pakistan, Tibet and Nepal are some of the biggest rug exporters. Persian rugs also are Oriental rugs but they are made only in Iran (formerly known as Persia). Characteristics of a Persian rug include an unusually thick pile (up to 160 knots per square inch), extremely rich color combinations and unique designs, and a very distinct knot. Persian carpets are traditionally known for their tremendous variety in design, color, size, and weave. Moreover, they are known for the uniqueness of each and every rug produced. Rugs are generally named after the village, town or district where they are woven or collected, or by the weaving tribe in the case of nomadic pieces. The art of carpet weaving existed in Iran in ancient times, according to evidences and in the opinion of scientists, the 500 B.C. Pazyric carpet dating back to the Achaemenid period. The first documented evidence on the existence of Persian carpets came from Chinese texts dating back to the Sassanid period (224 - 641 CE). Historical records show that the Achaemenian court of Cyrus the Great at Pasargade was decked with magnificent carpets. This was over 2500 years ago. Alexander II of Macedonia was said to have been dazzled by the carpets in the tomb area of Cyrus the Great at Pasargade. The advanced weaving technique used in the Pazyryk carpet indicates a long history of evolution and experience in this art. 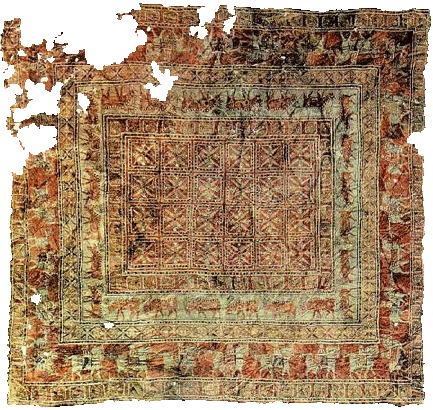 Pazyryk carpet is considered as the oldest carpet in the world. Its central field is a deep red color and it has two wide borders, one depicting deer and the other Persian horseman. However, it believed that the carpet from Pazyryk is not likely a nomadic product, but a product of an Achaemenid carpet production centre. By the sixth century, Persian carpets of wool or silk were renowned in court circles throughout the Middle East. Each rug's particular pattern, palette, and weave are uniquely linked with the indigenous culture, and weaving techniques are specific to an identifiable geographic area or nomadic tribe. Typically, the more floral or formal the pattern, the more urban the area in which it was made, where as a more geometric pattern would be more likely to be from a tribe. Patterns that distinctly flow in a single direction were designed as "Prayer" rugs. Each family of weavers would place elements in the rugs design to record their history. The use of color also added to the record. White for wedding, whether it be to signify a death, a hunt, or a famine, it is these elements that make each Oriental rug unique. Green - paradise, sacred, "Prophet's color"
Most consumers know about "counting knots" to judge if the rug they are considering is of a high quality. Below you will find procedures to counting knots, but please be advised...The simple counting of knots is not a true test, but a guideline. The actual knot count needs to take into consideration the material used in the individual rug. Example: It is much more likely to accumulate an extreme knot count when the material used is silk, where as if you were to come across a rug woven from a thick wool, such as an antique Heriz, your count will be much lower than the silk, but the value of the carpet could run near $35 - $75,000.00. A consumer needs to take into count the entire carpet, the design, the dyes, the material used, as well as the emotional value they receive from a rug. If you purchase your carpet from a reputable dealer, then the only thing the average consumer need to know is if they appreciate the appearance of the carpet and if the carpet fits into their budget. How do you know when to count one bump on the back of the rug as one knot? It's easy... Look carefully at the individual areas of color across the width of the back of the rug. If you only see colored elements in pairs, you need to count each pair as one knot. If you see lots of single colored elements, the rug has offset warps and each element should be counted as one knot. Many country rugs from Turkey, Afghanistan, and Iran show both knot elements on the back of the rug, as do Bokharas from Pakistan. Most rugs from India and China have strongly offset warps, and so show only one knot element on the back of the rug.